A new art exhibition has been launched in Staffordshire dedicated to 100 years of the UK's Royal Air Force. The RAF officially reached the grand milestone of its centenary on Easter Sunday - 1 April 2018 - with the start of six months of commemorative events around the country. 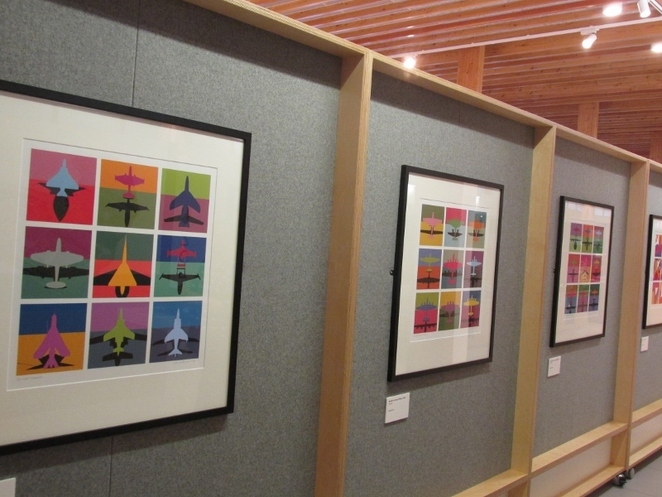 But the one hundred year existence of the RAF has also been marked with the unveiling of a special art exhibition on the theme of aviation at the National Memorial Arboretum in Alrewas, near Lichfield. 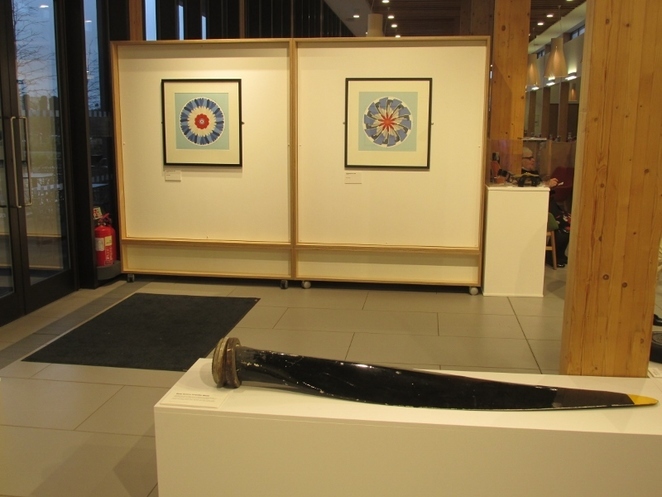 Entitled 'Tribute 100', the exhibition, which is free to view, will be on public display within the Arboretum's main Remembrance Centre from March 30 until June 30. 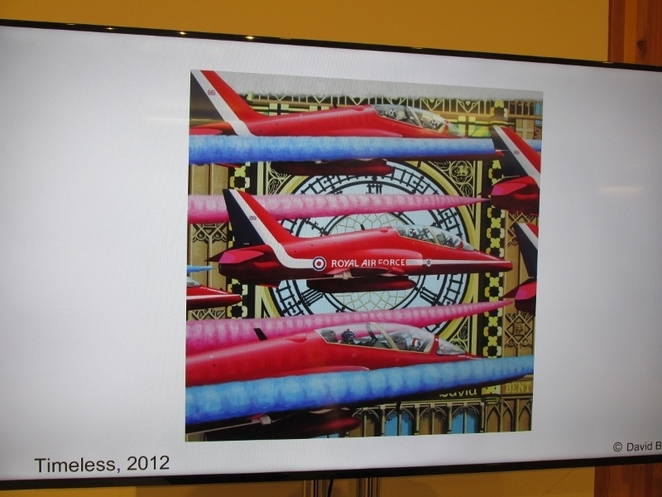 The artwork has all been produced by renowned aviation artist David Bent, whose solo exhibitions have previously been displayed at locations such as The Royal Air Force Museum, The Royal Air Force Club, and the Crypt at St Paul's Cathedral, as well as Farnborough and Dubai International Air Shows. David, who used a variety of aircraft and propeller shapes in his art, said at the launch: "I had already started working on art around the centenary of the Royal Air Force, and to have my exhibition launched at such a meaningful place as the National Memorial Arboretum is the perfect marriage." 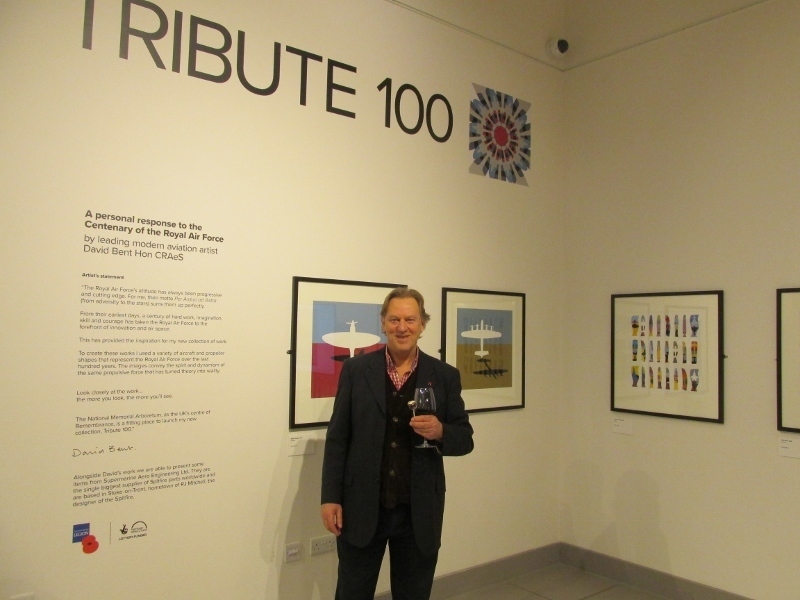 The opening of the exhibition was also attended by Air Commodore Nigel Bradshaw, who is heading up the national RAF100 project marking the centenary of the Royal Air Force. The campaign officially launched on Sunday 1 April with the RAF100 Baton Relay. It is then due to run for approximately six months, with a programme of public events at national and regional levels. Air Commodore Bradshaw said at the Arboretum: "It is a real privilege to be here. I am here to represent the Royal Air Force which celebrates a hundred years on Easter Sunday. We are launching a whole campaign of activities, but the purpose of RAF100 is three-fold - to commemorate the service and sacrifice of many men and women over the years, to celebrate the remarkable people who make up the modern air force, and to inspire the next generation. We want to be a springboard for the second century." The RAF was formed towards the end of the First World War, on 1 April 1918, and is the oldest independent air force in the world. Visitors to the 'Tribute 100' exhibition at the National Memorial Arboretum are encouraged to spend time looking closely at the artworks to discover elements and perspectives hidden within. In addition, the exhibition also includes a number of pieces of equipment from a World War Two Spitfire fighter aircraft, among them an actual propeller blade which was made of wood at the time the iconic plane flew the skies. The National Memorial Arboretum, which is part of the Royal British Legion, is the UK's year-round Centre for Remembrance which honours the fallen and recognises service and sacrifice. The site is home to more than 350 memorials as well as almost 30,000 trees.